The ease with which we criminalize and abuse black youth in this country would be astounding if it weren’t so routine. In March, we learned that under the new NYPD police commissioner, Bill Bratton, the number of stop-and-frisks police were making dramatically decreased. The New York Times reported that in the first two months of 2014 “police officers recorded making 353 stops for behavior deemed suspicious, compared with 5,983 last year.” And while that’s a welcome change from the sky-high number of racist and unconstitutional stop-and-frisks the city saw under Police Commissioner Ray Kelly, it does not spell the end of an overly aggressive police force. The Times also reported that “the arrests of peddlers and panhandlers on subways have more than tripled over the same period last year, with the police recording 274 such arrests as of March 2. By this point last year, they had made 90 such arrests.” Arrests like these effectively penalize the poor and homeless for the ways in which they survive. Additionally, notes the Times, “Police statistics also indicate a noticeable spike in arrests for low-level violations in public housing developments.” While felony arrests were down 5 percent and misdemeanors flat, the number of arrests for violations, “a category that includes drinking beer in public and riding a bike on the sidewalk,” were up 21 percent. 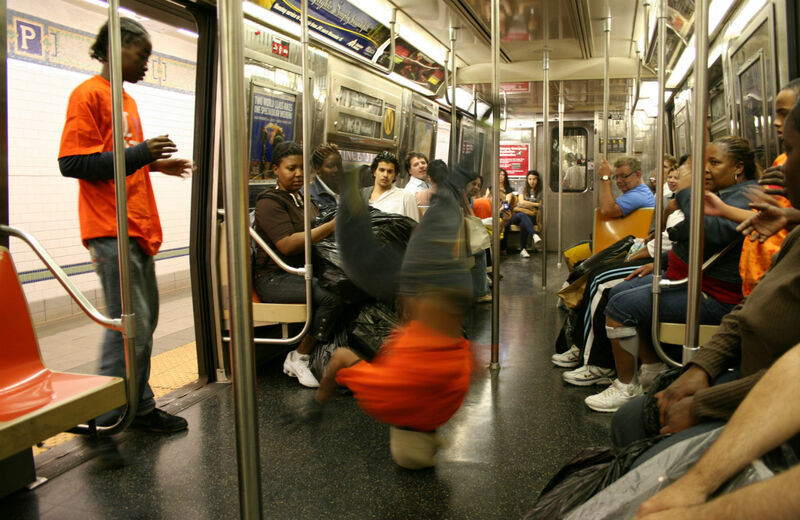 One of the groups targeted in this new crackdown: subway break dancers. Almost anyone who has taken the subway in NYC has seen them, usually a crew of about four or five, typically young black men, who play loud music and perform in the subway car in hopes that passengers will be generous enough to tip them afterward. So far this year, NYPD has arrested forty-six of them and charged them with reckless endangerment. Admittedly, the dancers can be, at times, a little annoying. The instant they shout “Showtime!” and turn on the music, what could have been a quiet train ride is transformed into a party, whether you signed up for it or not. But the minor inconvenience they may pose for the few minutes they dance is certainly not worth an arrest. I also find it hard to be mad at them, knowing that school budgets, particularly for the arts, have been slashed to the point that few creative outlets exist for these kids, and we make next to no effort to create the jobs that would replace the money they earn from their dancing. If subway riders are complaining about the disturbance they cause, there must be another way to deal with them that doesn’t involve giving them arrest records. Commissioner Bratton said of the subway dancers, “Those activities create a sense of fear, or that we’re not paying attention to disorder.” Those scary, disorderly, dancing young black bodies. Always causing fear. And how long before that fear results in what happened to Nubia Bowe in Oakland?